A BIG THANK YOU! TO OUR SPONSORS AND SheilaLynnK Art Studio Patrons! Events, Activities, and Project videos are made possible by the support of patrons like you. Watch "5 Minutes for the Arachnoiditis Survivors" featuring the YEAR 2 Survivor Song entry, "Needles" by Brock Babcock (husband of Arachnoiditis Survivor, Michelle Babcock). $5,000 Project Benefactor CONTACT THE STUDIO for details of 2016-2017 Listings associated with this contribution. $250 Memorial Sponsor ~The Survivors' Art Exhibit is dedicated Annually to the Memory of the ones we've lost. January 2015 The Art For Arachnoiditis Project became a member of the Wellness Universe On-line Directory of Professional Wellness Resources. 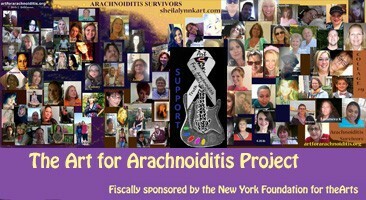 February 2015 The Art For Arachnoiditis Project was awarded Fiscal Sponsorship by The New York Foundation For The Arts.